Not to be confused with Thallium or Thorium. Thulium is a chemical element with symbol Tm and atomic number 69. It is the thirteenth and antepenultimate (third-last) element in the lanthanide series. Like the other lanthanides, the most common oxidation state is +3, seen in its oxide, halides and other compounds. 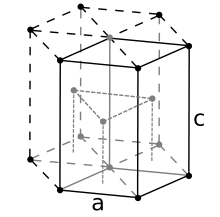 In aqueous solution, like compounds of other late lanthanides, soluble thulium compounds form complexes with nine water molecules. In 1879, Swedish chemist Per Theodor Cleve separated in the rare earth erbia another two previously unknown components, which he called holmia and thulia: these were the oxides of holmium and thulium respectively. A relatively pure sample of thulium metal was first obtained in 1911. Thulium is the second least abundant of the lanthanides after promethium, which is only found in trace quantities on Earth. It is an easily workable metal with a bright silvery-gray luster. It is fairly soft and slowly tarnishes in air. Despite its high price and rarity, thulium is used as the radiation source in portable X-ray devices and in solid-state lasers. It has no significant biological role and is not particularly toxic. The element is never found in nature in pure form, but it is found in small quantities in minerals with other rare earths. Thulium is often found with minerals containing yttrium and gadolinium. In particular, thulium occurs in the mineral gadolinite. However, thulium also occurs in the minerals monazite, xenotime, and euxenite. 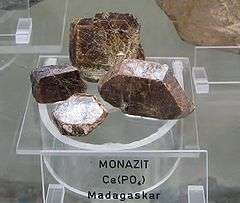 Its abundance in the Earth crust is 0.5 mg/kg by weight and 50 parts per billion by moles. Thulium makes up approximately 0.5 parts per million of soil, although this value can range from 0.4 to 0.8 parts per million. Thulium makes up 250 parts per quadrillion of seawater. In the solar system, thulium exists in concentrations of 200 parts per trillion by weight and 1 part per trillion by moles. Thulium ore occurs most commonly in China. However, Australia, Brazil, Greenland, India, Tanzania, and the United States also have large reserves of thulium. Total reserves of thulium are approximately 100,000 tonnes. Thulium is the least abundant lanthanide on earth except for promethium. Thulium is principally extracted from monazite ores (~0.007% thulium) found in river sands, through ion-exchange. Newer ion-exchange and solvent-extraction techniques have led to easier separation of the rare earths, which has yielded much lower costs for thulium production. The principal sources today are the ion adsorption clays of southern China. In these, where about two-thirds of the total rare-earth content is yttrium, thulium is about 0.5% (or about tied with lutetium for rarity). The metal can be isolated through reduction of its oxide with lanthanum metal or by calcium reduction in a closed container. None of thulium's natural compounds are commercially important. Approximately 50 tonnes per year of thulium oxide are produced. In 1996, thulium oxide cost US$20 per gram, and in 2005, 99%-pure thulium metal powder cost US$70 per gram. Despite being rare and expensive, thulium has a few applications. Holmium-chromium-thulium triple-doped Yttrium aluminum garnet (Ho:Cr:Tm:YAG, or Ho,Cr,Tm:YAG) is an active laser medium material with high efficiency. It lases at 2097 nm and is widely used in military applications, medicine, and meteorology. Single-element thulium-doped YAG (Tm:YAG) lasers operate between 1930 and 2040 nm. The wavelength of thulium-based lasers is very efficient for superficial ablation of tissue, with minimal coagulation depth in air or in water. This makes thulium lasers attractive for laser-based surgery. Despite its high cost, portable X-ray devices use thulium that has been bombarded in a nuclear reactor as a radiation source. These sources have a useful life of about one year, as tools in medical and dental diagnosis, as well as to detect defects in inaccessible mechanical and electronic components. Such sources do not need extensive radiation protection – only a small cup of lead. Thulium-170 is gaining popularity as an X-ray source for cancer treatment via brachytherapy. This isotope has a half-life of 128.6 days and five major emission lines of comparable intensity (at 7.4, 51.354, 52.389, 59.4 and 84.253 keV). Thulium-170 is one of the four most popular radioisotopes for use in industrial radiography. Thulium has been used in high-temperature superconductors similarly to yttrium. 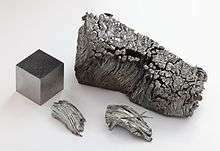 Thulium potentially has use in ferrites, ceramic magnetic materials that are used in microwave equipment. Thulium is also similar to scandium in that it is used in arc lighting for its unusual spectrum, in this case, its green emission lines, which are not covered by other elements. Because thulium fluoresces with a blue color when exposed to ultraviolet light, thulium is put into euro banknotes as a measure against counterfeiting. The blue fluorescence of Tm-doped calcium sulfate has been used in personal dosimeters for visual monitoring of radiation. There is only a very small amount of thulium in the human body, but the exact amount is unknown. Thulium has not been observed to have a biological role, but small amounts of soluble thulium salts stimulate metabolism. Soluble thulium salts are mildly toxic, but insoluble thulium salts are completely nontoxic. When injected, thulium can cause degeneration of the liver and spleen and can also cause hemoglobin concentration to fluctuate. Liver damage from thulium is more prevalent in male mice than female mice. Despite this, thulium has a low level of toxicity. In humans, thulium occurs in the highest amounts in the liver, kidneys and bones. Humans typically consume several micrograms of thulium per year. The roots of plants do not take up thulium, and the dry weight of vegetables usually contains one part per billion of thulium. Thulium dust and powder are toxic upon inhalation or ingestion and can cause explosions. Radioactive thulium isotopes can cause radiation poisoning. 1 2 3 4 5 6 7 8 9 10 11 12 Emsley, John (2001). Nature's building blocks: an A-Z guide to the elements. US: Oxford University Press. pp. 442–443. ISBN 0-19-850341-5. 1 2 3 Hammond, C. R. (2000). "The Elements". Handbook of Chemistry and Physics (81st ed.). CRC press. ISBN 0-8493-0481-4. ↑ "Chemical reactions of Thulium". Webelements. Retrieved 2009-06-06. ↑ Patnaik, Pradyot (2003). Handbook of Inorganic Chemical Compounds. McGraw-Hill. p. 934. ISBN 0-07-049439-8. 1 2 Krebs, Robert E (2006). The History and Use of Our Earth's Chemical Elements: A Reference Guide. ISBN 978-0-313-33438-2. ↑ Eagleson, Mary (1994). Concise Encyclopedia Chemistry. Walter de Gruyter. p. 1105. ISBN 978-3-11-011451-5. 1 2 Thulium. Chemicool.com. Retrieved on 2013-03-29. ↑ Lide, David R. (1998). "Section 11, Table of the Isotopes". Handbook of Chemistry and Physics (87th ed.). Boca Raton, FL: CRC Press. ISBN 0-8493-0594-2. 1 2 Sonzogni, Alejandro. "Untitled". National Nuclear Data Center. Retrieved 2013-02-20. ↑ Eagleson, Mary (1994). Concise Encyclopedia Chemistry. Walter de Gruyter. p. 1061. ISBN 978-3-11-011451-5. ↑ Castor, Stephen B. & Hedrick, James B. "Rare Earth Elements" (PDF). Retrieved 2009-06-06. ↑ Walker, Perrin & Tarn, William H. (2010). CRC Handbook of Metal Etchants. CRC Press. pp. 1241–. ISBN 978-1-4398-2253-1. ↑ Koechner, Walter (2006). Solid-state laser engineering. Springer. p. 49. ISBN 0-387-29094-X. ↑ Duarte, Frank J. (2008). Tunable laser applications. CRC Press. p. 214. ISBN 1-4200-6009-0. 1 2 Gupta, C. K. & Krishnamurthy, Nagaiyar (2004). Extractive metallurgy of rare earths. CRC Press. p. 32. ISBN 0-415-33340-7. ↑ Krishnamurthy, Devan; Vivian Weinberg; J. Adam M. Cunha; I-Chow Hsu; Jean Pouliot (2011). "Comparison of high–dose rate prostate brachytherapy dose distributions with iridium-192, ytterbium-169, and thulium-170 sources". Brachytherapy. 10 (6): 461–465. doi:10.1016/j.brachy.2011.01.012. PMID 21397569. ↑ Gray, Theodore W. & Mann, Nick (2009). The Elements: A Visual Exploration of Every Known Atom In The Universe. Black Dog & Leventhal Publishers. p. 159. ISBN 978-1-57912-814-2. ↑ Wardle, Brian (2009-11-06). Principles and Applications of Photochemistry. p. 75. ISBN 978-0-470-71013-5.